The Laura Bush 21st Century Librarian Program (LB21) supports developing a diverse workforce of librarians and archivists to better meet the changing learning and information needs of the American public. The program makes grants to enhance the training and professional development opportunities for of library and archives professionals, develop faculty and library leaders, and recruit and educate the next generation of library and archives professionals. The Native American Library Services Basic Grants Program provides funding for tribal library staff to support existing library operations and maintain core library services. This includes taking library-related continuing education courses or training workshops; making or attending presentations at conferences related to library services; and/or hiring a consultant for an onsite professional library. Museums Empowered, a special initiative of the Museums for America (MFA) program, helps institutions of all sizes and disciplines increase their capacity to better respond to their communities through staff professional development opportunities. IMLS encourages applicants to invest in the professional development of museum staff, volunteers, and interns to enhance their skills and ensure the highest standards in all aspects of museum operations. National Leadership Grants support projects that enhance the quality of library and archive services nationwide by advancing theory and practice. Museums may apply for these grants through the Professional Development category. Museum Grants for African American History and Culture support activities that build the capacity of African American museums and support the growth and development of museum professionals at African American museums. 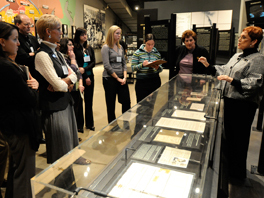 Professional development for museum staff is one of the key goals of this grant program.